Looks like someone at 2K Games had a little leftover resurrection potion from whatever they used on Duke Nukem Forever because the formerly dead downloadable content for BioShock 2 on PC is alive. It's coming. Viva PC Gaming Week! 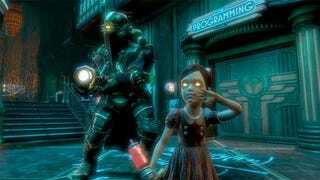 Over on the 2K forums, 2K Elizabeth spreads the news that BioShock 2's PC patch as well as the Protector Trials and Minvera's Den downloadable expansions — both of which are out for the console versions of the game — are back in development. The patch and Protector Trials had been scuttled because they were too buggy when 2K's deadline for them hit. Minerva's Den (which we liked a lot on console) just wasn't done. Following a rash of fan feedback and an unexplained change in resources or priorities, 2K Elizabeth says work on all of that is being resumed. 2K estimates the patch and Protector Trials will be out in December and will offer them for free. Minerva's Den's schedule is more murky, though 2K Elizabeth says the team is committed to finishing it and releasing it.